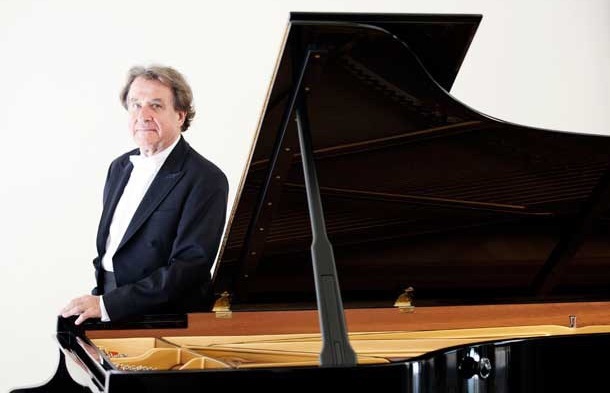 Rudolf Buchbinder joins the Vienna Philharmonic. Rudolf Buchbinder played Brahms' Piano Concerto No. 1 at Carnegie Hall on Friday night. The Osaka Philharmonic Orchestra plays Shostakovich. and the uprisings of the year 1905. Like the people of Russia, the Eleventh and Twelfth Symphonies of Dmitri Shostakovich have suffered since their premieres. 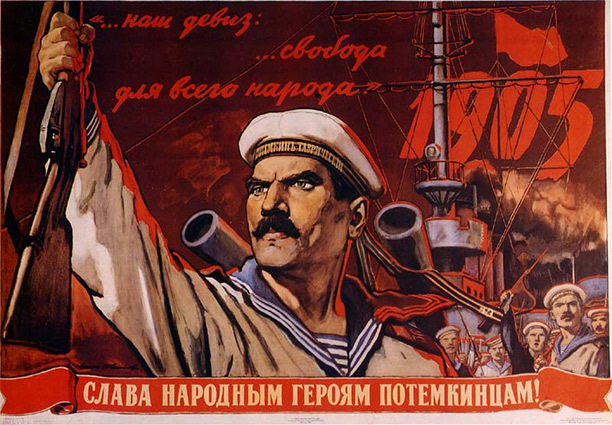 Composed at the peak of the composer's considerable powers, these pieces as grand public gestures, written to commemorate the start of the Russian Revolution (in the Eleventh) and its triumphant conclusion in the Twelfth. Each symphony is a programmatic work in four movements, requiring enormous orchestral forces and considerable lung power from the woodwinds and brass. The sounds of Scotland come to Fukuoka. 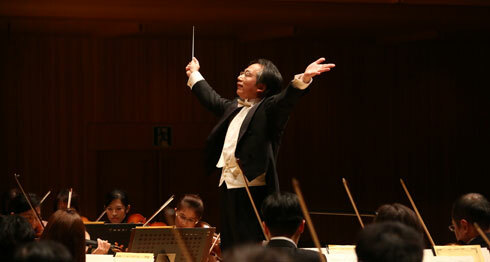 Maestro Shao-Chia Liu led the Kyushu Symphony Orchestra in Mendelssohn and Bruch. Photo from the Taiwan Philharmonic. The vast distance between Scotland and Fukuoka, located on the southern island of Kyushu, Japan narrowed on Friday, February 17, when the Kyushu Symphony Orchestra offered an evening of works inspired by that faraway country. On the podium, Shao-Chia Lu, a guest conductor visiting from Taiwan where he is the music director of the Taiwan Philharmonic. 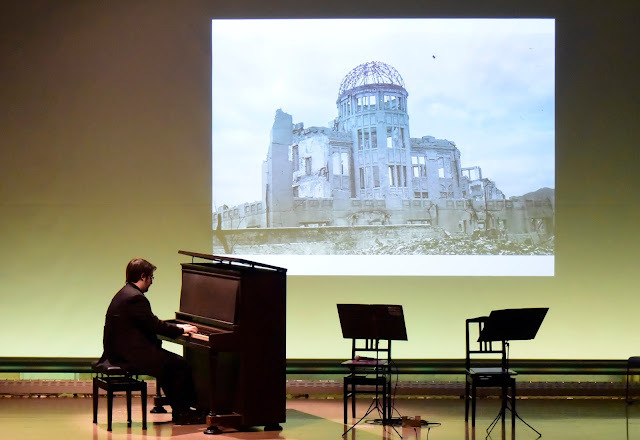 The Hiroshima Symphony Orchestra plays for peace. the nuclear blast. In the background looms the A-Bomb Dome, which was not as lucky. Photo © 2017 Association of Japanese Symphony Orchestras and Hiroshima Peace Museum. The city of Hiroshima, located on the southern end of the big Japanese island of Honshu, remains best known for one date: Aug. 6, 1945. This was where the American bomber Enola Gay dropped "Little Boy," the first of only two atomic bombs ever used against human beings. Since that fatal day, Hiroshima has returned from its ashes as a symbol of international peace. The Peace Museum, the Cenotaph and the A-Bomb Dome (a building that survived the blast) speak volumes by simply standing and saying nothing. The Vienna Philharmonic returns to Carnegie Hall. 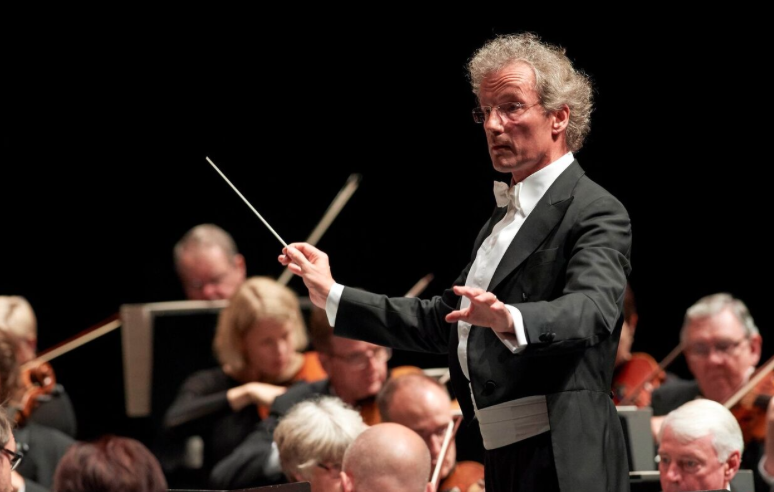 Franz Weiser-Möst led the Vienna Philharmonic on Friday night. Photo by Michael Pöhm courtesy IMG Artists. The arrival of the Vienna Philharmonic at Carnegie Hall is a cause for general celebration (if you have tickets) and a reason for people to swarm on the sidewalk seeking a single or a pair to hear this venerable orchestra and its unique sound. On Friday night, the Viennese gave the first of three weekend concerts under the baton of Austrian son Franz Welser-Möst. 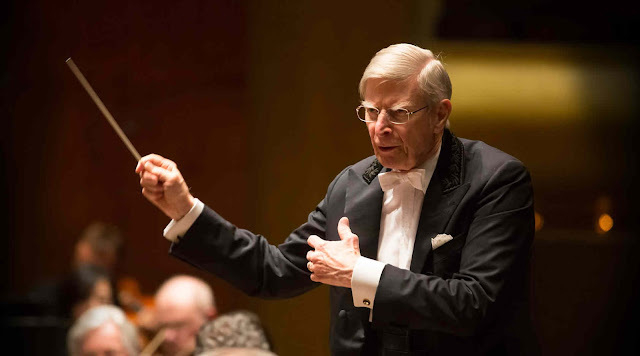 Herbert Blomstedt conducts the New York Philharmonic. Herbert Blomstedt at the helm of the New York Philharmonic. Photo by Chris Lee © 2016 New York Philharmonic. The two symphonies that Beethoven wrote while convalescing at a spa in 1812 occupy a cherished place in the orchestral repertory. No. 7 and No. 8 have consecutive opus numbers, (No. 92 and 93, respectively) and represent a composer determined to grasp the idea of joy with both hands even when facing serious health problems and considerable personal hardship. Paavo Järvi leads the NHK Symphony Orchestra. Paavo Järvi (right) leads the NHK Symphony Orchestra. The Baltic Sea in the northeast corner of Europe is flanked by the countries of Estonia and Finland, some fair distance from Japan and its capital city of Tokyo. 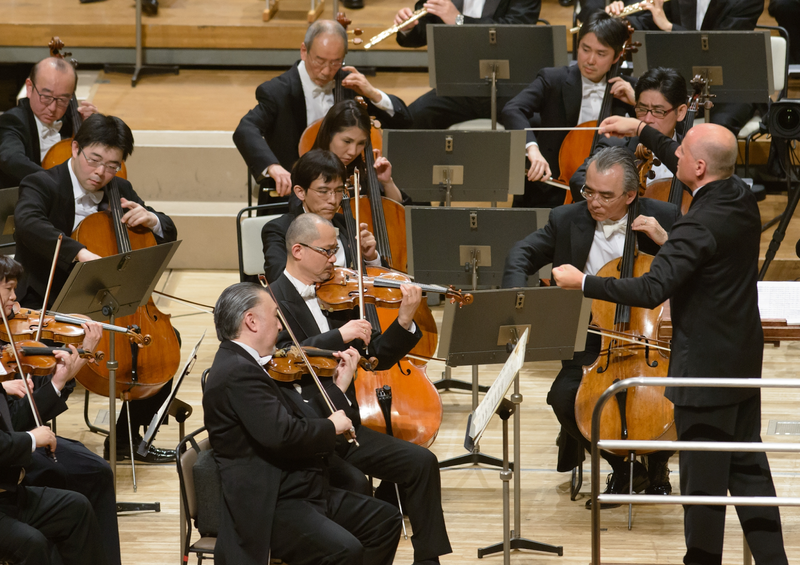 On Sunday, February 12, the Estonian conductor Paavo Järvi brought the sounds of the Baltic to NHK Hall in Shibuya, the bustling shopping district that is home to the NHK ((Nippon Hōsō Kyōkai) Japan's broadcasting corporation. 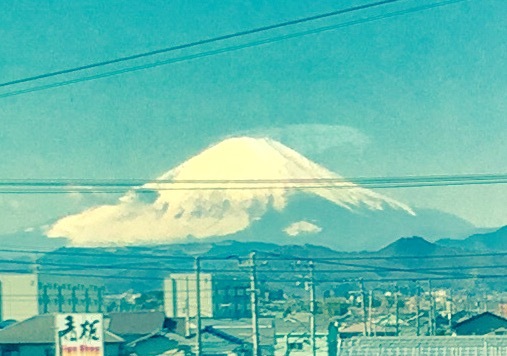 Fujiyama from the Shin-kan-sen. Photo by the author. The 2017 Hearing Japanese Orchestras project provided the opportunity for four Western critics, (myself included) to encounter the sound of five very different ensembles in very different cities. It was also a culturally immersive experience, my first visit to Japan and an opportunity to hear familiar and unfamiliar music presented at a generally high level. 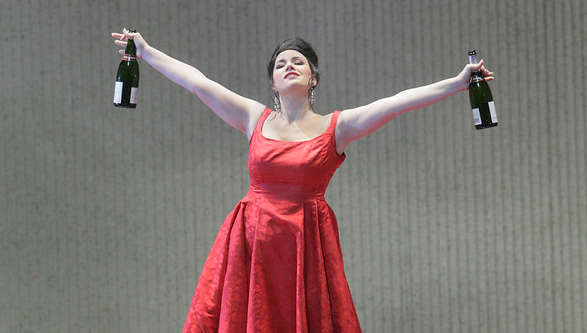 Richard Strauss' fourth opera is black and white...and red all over. The bloody axe used to kill Agamemnon is a central plot point of Strauss' Elektra. Richard Strauss chose to follow up the whirlwind success of Salome with Elektra, an opera that shares several points of similarity. Both works have a heroine who descends into insanity, horrific offstage murder (two this time) and take place in a single, intense act that lasts about an hour and a half. However, Elektra much more than Strauss repeating himself: it was a great leap forward. The girl in the red dress goes back on the clock. Sonya Yoncheva returns to sing Violetta in the Met's controversial, clock-watching production of Verdi's tragic masterpiece. Richard Strauss' shocking opera still makes heads roll. When Richard Strauss unveiled Salome in 1905, he was already a leading light among German composers and conductors. He was born in Bavaria, and his father Franz was =the principal horn player at the first Bayreuth performances of Wagner's Ring. The former Police-man discusses his fifth opera, premiering Feb. 18. 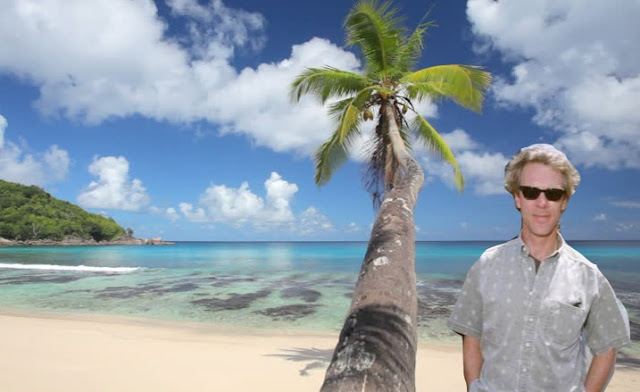 Welcome to The Island of Morel with your guide: Stewart Copeland. with a famous musician but not as much fun. Stewart Copeland rose to fame as the founder and drummer of the rock band The Police, who burst out of the British punk scene to top the charts in the 1980s. He has been a composer since The Police broke up, branching from soundtracks and TV scores to orchestral works and opera. His fifth and latest is is The Invention of Morel, a co-production between the Long Beach Opera and the Chicago Opera Theater. Morel bows at the Studebaker Theater on February 18. The Met brings back its handsome new Werther...without its star, Jonas Kaufmann. Isabel Leonard stands strong as Charlotte in Massenet's Werther. Well actually this photo is of the mezzo in Cosí fan tutti but we're on deadline. Photo © 2017 The Metropolitan Opera. Vittorio Grigolo has big shoes to fill (Jonas Kaufmann's) as the Met revives its Richard Eyre staging of Werther, the tale of a lovestruck poet whose tragic love for the beautiful Charlotte (Isabel Leonard) leads to suicide. Joshua Gersen steps in at the New York Philharmonic. 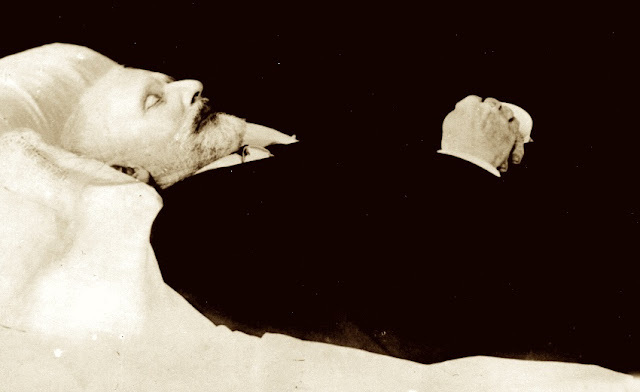 Tchaikovsky on his deathbed, 1893. Image from Wikimedia Commons. The New York Philharmonic's three-week Tchaikovsky festival Beloved Friend hit an iceberg on Thursday, when a stomach flu felled curator and conductor Semyon Bychkov, whose idiosyncratic interpretations of this well-worn composer have breathed new life into the current season. His replacement was Joshua Gersen, the orchestra's assistant conductor, in his subscription debut. The next Superconductor Audio Guide series will focus on Richard Strauss. Richard Strauss stuffed the ballot box and will be the subject of the next Superconductor Audio Guide retrospective. Photoshop and award design by Paul J. Pelkonen. 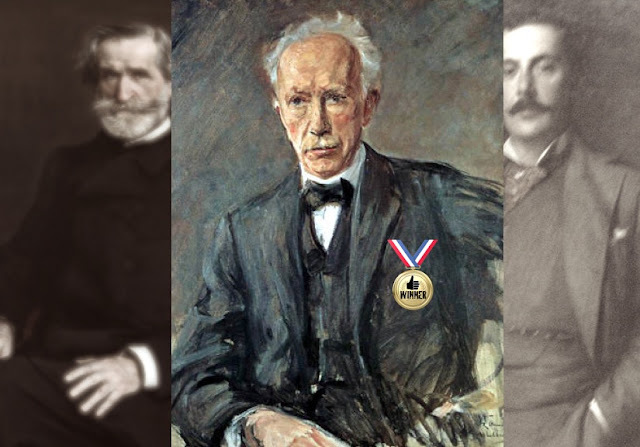 Superconductor has completed its first-ever reader's poll and the winner is....Richard Strauss! The German composer is your choice to be the focus of the next series of Superconductor Audio Guides, the regular series that tracks the life of a great composer through a chronological output of operas and other pieces, and offers analysis of some of their major compositions. Last year the operas of Wagner and Mozart have been written up in this fashion, and this year it's Strauss' turn. Richard Strauss represents the last bastion of German Romanticism. A masterful composer and conductor, he started as a creator of vivid, sometimes shocking tone poems that employed giant orchestras to create incredible effects. Today he is best remembered for the introduction to his tone poem Also Sprach Zarathustra, used to memorable effect by Stanley Kubrick in the film 2001: A Space Odyssey. Elektra: Greek tragedy, German orchestration. 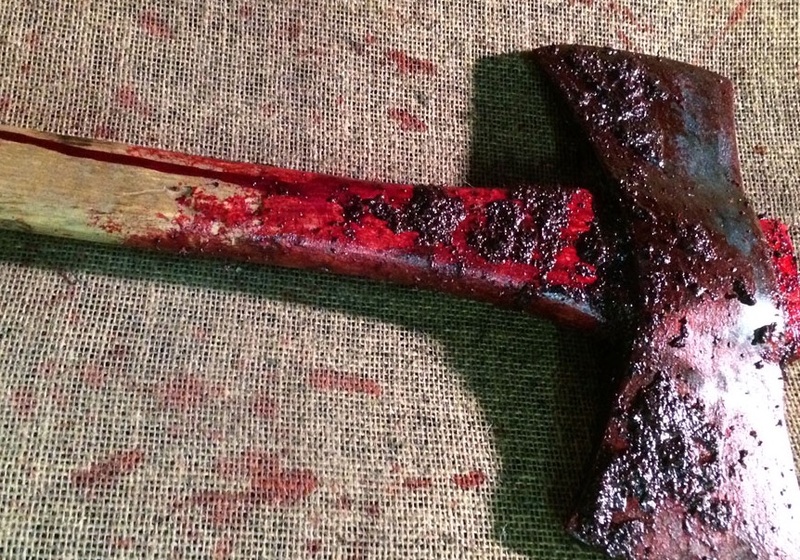 Blood everywhere. Der Rosenkavalier: A turn toward Mozartean comedy and Strauss' biggest stage success. Die Frau ohne Schatten: A "quest" opera: think Die Zauberflöte on a Wagnerian scale. Arabella: Another Viennese comedy, bittersweet and lovely. Capriccio: Strauss' last opera is a meditation on the nature of opera itself. If you voted for Giuseppe Verdi or Giacomo Puccini, they will both be covered in future blog installments. 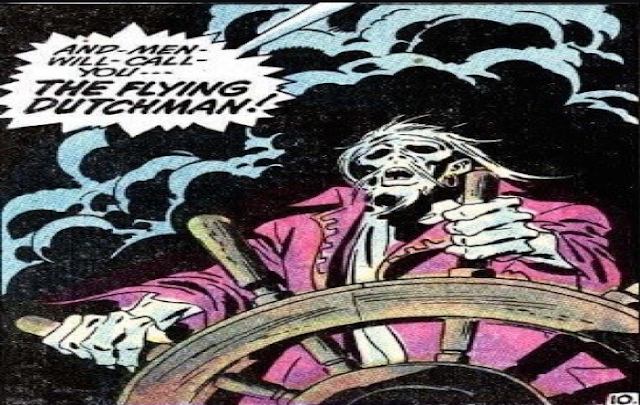 As of this writing, the plan is for seven (or ten) Strauss operas, followed by the early operas of Verdi (Nabucco through La Traviata) the major works of Puccini Manon Lescaut to Turandot) and finally, the late operas of Verdi (Simon Boccanegra to Falstaff. Yes there are gaps in that list.) That's the plan as of this writing but things could of course change. 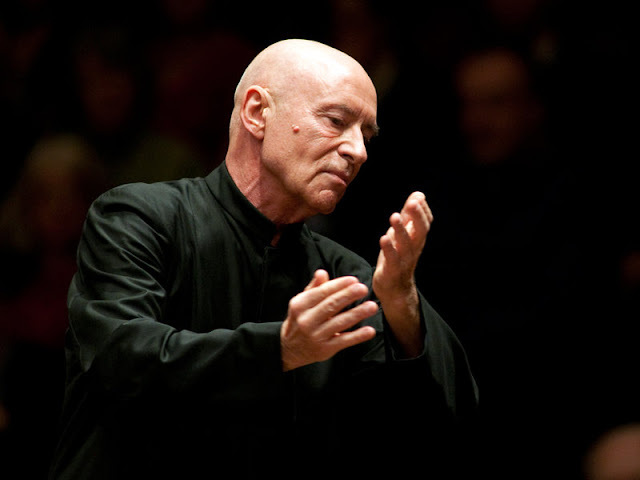 Christoph Eschenbach brings the Bamberg Symphony to Carnegie Hall. Photo by Margot Ingoldsby Schulman for the National Symphony Orchestra. Carnegie Hall is one of the busiest venues in New York City, booking hundreds of concerts each calendar year through its in-house organization and also hosting a myriad of other performances who rent out the historic venue to play. One such concert was on Wednesday night, when the Bamberg Symphony Orchestra returned to New York under the baton of Christoph Eschenbach. Juditha Triumphans triumphs at Carnegie Hall. 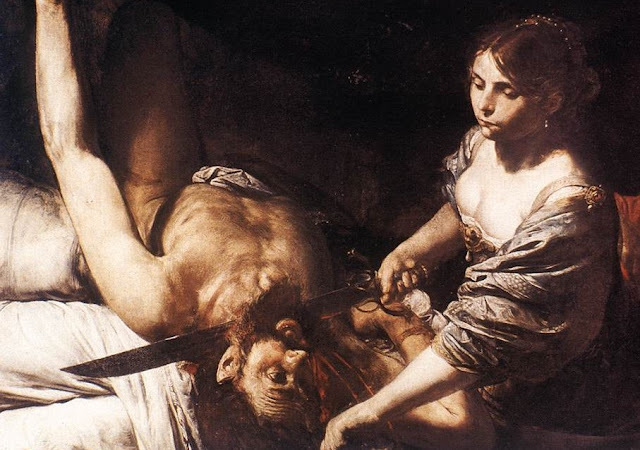 Judith and Holofernes by Valentin de Bolougne. The music of Antonio Vivaldi was forgotten for centuries. When he was rediscovered in the 20th century, he rapidly emerged as one of the greatest composers of Renaissance Venice. The father of the multi-movement violin concerto, he was also a teacher of music, the creator of 94 operas and (at least) four oratorios. On Tuesday night, Carnegie Hall resounded with its first performance of his lone surviving oratorio, Juditha Triumphans. 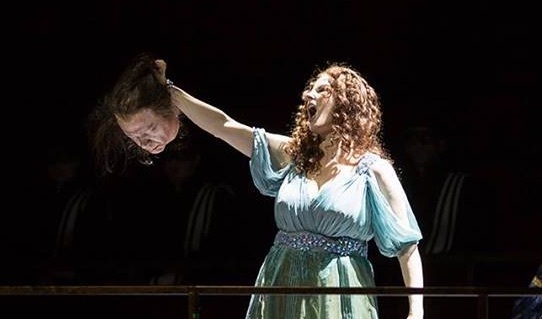 The Metropolitan Opera hooks a new Rusalka. All dried out: Kristin Opolais (top) is the mermaid and Brandon Jovanovich is the Prince in the Met's new Rusalka. The Metropolitan Opera has a new production of Rusalka, adding the Dvořák fairy-tale opera to the long list of repertory works receiving new productions under the stewardship of general manager Peter Gelb. This new production is the fourth by director Mary Zimmerman, whose past stagings have ranged from innovative (Lucia di Lammermoor) to unwatchable claptrap (Armida). The show is centered around Kristine Opolais, inheriting the swim fins of Renée Fleming in the title role: a mermaid whose love for a handsome prince leads her to become fully human. Jordi Savall opens La Serenissima at Carnegie Hall. The elegant and scholarly Jordi Savall and friend. Image by Molina Visuals. 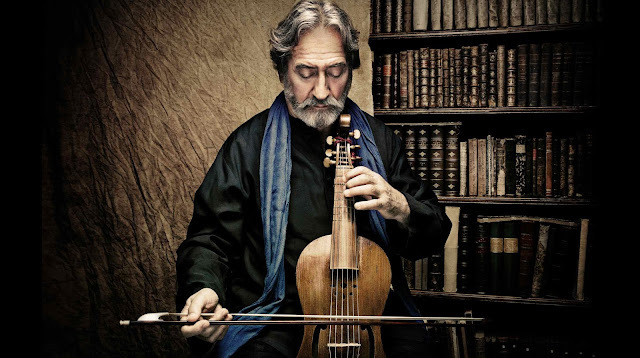 A millennium is a long time, but not in the hands of Jordi Savall. Mr. Savall took the main stage of Carnegie Hall last Friday night, to lead the opening concert of the three week La Serenissima festival. This is a citywide celebration of the music, culture and rich history of Venice, Italy, curated by Mr. Savall, a musicologist, conductor and master of the viol, an 18th century instrument played between the knees. Week Two of Beloved Friend at the Philharmonic. 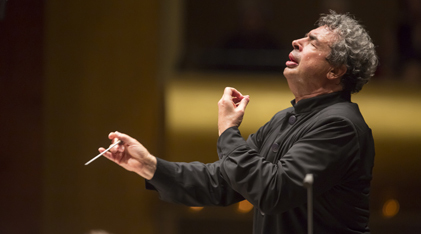 Emotive: Semyon Bychkov conducts Tchaikovsky at Lincoln Center. Upon initial examination, there appears to be little imagination or initiative in devoting three weeks of the New York Philharmonic's season to the music of Piotr Ilyich Tchaikovsky. However, thanks to some innovative performance choices and imaginative programming, the current Beloved Friend festival under the curation and baton of conductor Semyon Bychkov is proving to be something of a watershed. 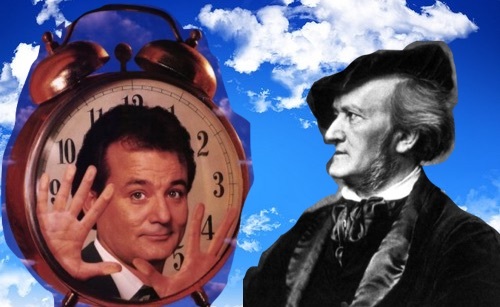 "So This Is How You Spend Eternity"
Time, Groundhog Day and Wagner's Parsifal. Two fools a minute: Bill Murray and Richard Wagner. Photo of Bill Murray from promotional art for Groundhog Day © 1993 Columbia/Tri-Star Pictures. It's Groundhog Day...again, and this morning's entertainment was a rewatch of the 1993 Bill Murray comedy. If you've never seen it, Groundhog Day is the Harold Ramis film about a Pennsylvania weatherman who travels to sleepy Punxsatawney, PA only to find himself trapped in a (seemingly) infinite time loop where it is always February 2nd. In this essay, we will explore how Phil's plight mirrors the plot of Wagner's final (and most mysterious) opera, Parsifal. The Met's "Vegas" Rigoletto breaks even. 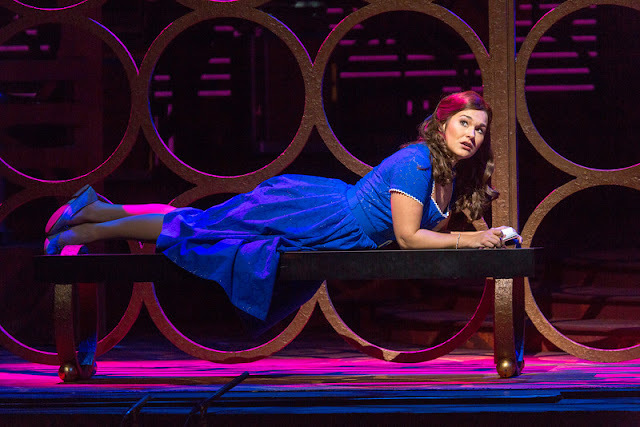 Olga Peretyatko in Act I of the Met's current Rigoletto. The Metropolitan Opera's economic model relies on a careful balance between modern operas (to remain relevant), rarities (to remain interesting) and tried-and-true war-horses like Giuseppe Verdi's Rigoletto. This month, the company revived its current Michael Mayer production, which moves the tale of a revenge-obsessed jester and a libertine Duke from Ye Olde Mantua to (of all places) Las Vegas, Nevada, roughly around the time that the Rat Pack held sway on the Strip.